Act 49, Session Laws of Hawaii 1980, permitted the airport to expediently and expeditiously remove abandoned, unclaimed or improperly stored vehicles at the airport. Act 81, Session Laws of Hawaii 1980, permitted the airport to operate a lost and found program for articles found on the premises of the airport. Honolulu International is a joint use facility with Hickam Air Force Base. Since a portion of the airfield is on the Air Force Base, a line of communication and working relationship was accorded the federal and state operations. The major portion of the airfield, including all air carrier and general aviation terminals and facilities are owned and operated by the State of Hawaii. The beautiful new Hawaiian Lei Stands were completed in January 1980. They are fully landscaped and allow customers to drive up and park in full view of many floral displays. The open air structures created for the lei makers are one of the most frequently visited areas in the airport. The new Central Concourse was dedicated on July 24, 1980 at an overall construction cost of $31.4 million. The 10 gates, 14-23, increased the airport’s capability of handling wide-body aircraft and allowed passengers to enplane and deplane directly from the holding rooms. The second floor area contained a restaurant, cocktail lounge, newsstand, restrooms, Visitor Information Program booth, telephones and other concession space. Tenant airline administrative and operations offices occupy the ground floor. 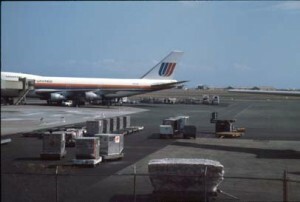 Prior to January 1, 1981, the right to sell and deliver in-bond merchandise to foreign-bound travelers at Honolulu International Airport was awarded by competitive bid on an exclusive basis. The department was advised that this arrangement might be in violation of anti-trust laws. On January 1, 1981, the department awarded contracts to two concessionaires. The question of the department’s right to grant exclusive concessions at Honolulu International Airport was resolved by the Legislature. Act 90, Session Laws of Hawaii 1982, gives the department the right to offer an exclusive duty free concession. Honolulu International Airport ranked 17th busiest in the world in 1981. Two beautification projects were completed. The popular carp (koi) ponds were improved and the Japanese garden area of the Central Concourse was landscaped. Energy conservation efforts continued. A new ground power system completed in February 1982 resulted in significant aircraft fuel savings for overseas carriers. The Airline Pilots Association upgraded the HNL rating to an orange star. The upgrading was a result of airport safety improvements installed by the airport and FAA including navigational aids, lighting and runway grooving, as well as a decrease in general aviation traffic. However the problem of the mix between jets and propeller driven general aviation aircraft remained. Until a site for a general aviation reliever airport has been established, this problem will persist and even grow in magnitude. 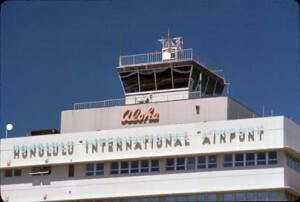 Members of the Professional Air Traffic Controllers Organization called a nationwide strike on Auagust 3, 1981 which affected air traffic in and out of HNL. The FAA used Navy controllers and retired/former controllers to maintain normal operations at HNL; however, some airline flights were delayed and an air defense exercise was cancelled. Passenger activity at HNL increased for the sixth consecutive year earning it the distinction of being the 16th busiest airport in the world according to a survey of the Airport Operators Council International. in 1982.On September 3, 1982, an agreement was reached on the Amended Exhibit One of the Airport-Airline Lease. These documents established the charges for airlines using the airport system and required signatory airlines to meet the difference between system revenues and expenses through use charges. During FY 1983, approximately $97 million worth of Airport System Revenue Bonds were called back and reissued at a savings of $20.6 million or $730,000 annually. A ground breaking ceremony was held for the Diamond Head Extension to the Main Terminal on September 14, 1982. This project streamlined passenger flow and upgraded baggage processing areas. The $18.3 million project included 10 baggage claim areas, 19 check in stations, the latest in energy saving devices, security equipment, signs, and landscaping. The project was scheduled for construction in two phases. A groundbreaking ceremony was held for the South Ramp Development project. The realignment of Lagoon Drive was the first phase of the $2.4 million project which will maximize land use and promote development of aviation-related support activities. Phase I was scheduled for completion in 1984. On November 11, 1982, the Honolulu Fueling Facilities Corporation announced that they had purchased Texaco, Shell and Union fueling facilities at the airport and on the Sand Island Access Road. They also announced a joint-financing venture with Hawaiian Independent Refinery. Hurricane Iwa hit Oahu and Kauai with winds of up to 85 m.p.h. on November 23, 1982. Electrical power was out for several days on both islands and HNL operated on emergency power for a few hours. Flight service was interrupted for a day as aircraft were diverted to Hilo during the storm. 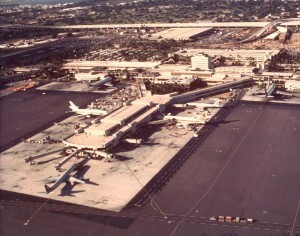 Work continued on Phase I of the 539,803-square foot Diamond Head Extension to the Main Terminal in 1983. The $18.3 million project, which was 80 percent complete, included construction of the structure’s rough concrete shell. Phase II construction commenced in April 1984 and was 5 percent complete. The $19.8 million project includes construction of 19 check-in stations, 10 baggage claim areas and office space increasing the airport’s total passenger handling capacity by approximately one third. Phase II is scheduled for completion in FY 1986. 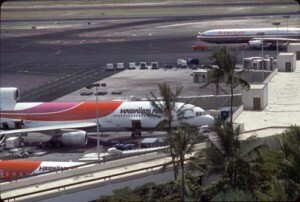 The three major interisland air carriers were consolidated at the Interisland Terminal complex. Site work was underway at the Interisland Terminal to help accommodate the increase in traffic. New airfield aprons and taxiways were under construction to create more parking area for the interisland carriers. The $5.2 million project was expected to be completed in FY 1985. Within the Interisland Terminal, major renovation was underway in the space used by Hawaiian and Mid Pacific Airlines. The $632,000 project included improvements to office space, baggage claim, ticket and holding areas. Site work was to be completed by FY 1985. The Interisland Terminal Access Road was widened to increase traffic capacity to the terminal. The $6.3 million project was scheduled for completion in FY 1985. An overseas access roadway, connecting the H-1 Freeway with the Main Terminal, was under construction to ease traffic flow into the main airport terminal. The $1.7 million project was scheduled for completion in FY 1985. The new $6.7 million FAA Air Traffic Control Tower, located between the two major East/West runways, was dedicated on June 23, 1984. Considered a much more strategic location than the old tower, the new building, tower and radar approach facility provided better visibility of runways and taxiways making the airport safer for all aircraft. A new 56,000 square foot Interisland Terminal, on the mauka side of the present facility, was in the design stages. Scheduled to begin construction in FY 1985, the new satellite terminal would expand passenger and flight traffic capacity. Improvements to the main airport terminal included the installation of 12 new passenger bridges in the Diamond Head, Ewa and Central Concourses. Airlines using these gates have the option of unloading and loading passengers through two bridges instead of one, thereby facilitating passenger flow in the terminal. The bridges were installed at a cost of $2.7 million. Building modifications to accept the new structures were put in for $794,000. Both projects were completed in FY 1984. Also in the Main Terminal, four new security doors were installed to provide access to the baggage claim from a secured area. Once completed in FY 1985, the $507,000 project eliminated the need for security guards in the area. Work continued on the access road towards Lagoon Drive to relocate utility lines underground. The $653,000 project should be completed in FY 1985. Approximately 90 percent of the utility lines at Honolulu International are underground and this project helps the airport move closer to its 100 percent goal. Underground utility wires are more desirable, especially at an airport facility, because they are safer and more aesthetically pleasing. The realignment of Lagoon Drive, part of the South Ramp Development project, continued. Phase I of the project, which included landfill, grading and the installation of sewer and drainage lines, was completed at a cost of $2.4 million. Phase II includes paving, utility relocation and construction of a new cargo terminal building, and will commence in FY 1985. Once completed in 1986, the $7.6 million project will help promote the development of aviation related support activities in the South Ramp area. The Pacific Aerospace Museum, a combination high technology educational complex and visitor attraction was scheduled to begin construction in January 1985. The 5,300 square foot facility on the Central Concourse will cost approximately $150,000. Construction of a general aviation reliever airport continued to be controversial. The FAA indicated its willingness to assist in making joint use of a military airport a solution to the problem. If accepted by the Department of Defense, this would be a preferred alternative to building a completely new airport. Rules and regulations for merchandise delivery at airports were implemented. Establishing such rules was very controversial with off-airport merchants who use airport space at no cost. However, merchandise piled in the ticket lobby created a hazard to the public. The new regulations will provide better control and additional revenues for the airport. Noise control of both fixed-wing and helicopters is a continuing responsibility by the FAA and the airport. Monitoring of noise and training of personnel keeps the problem from growing beyond manageable proportions. Honolulu International Airport ranked as the 17th largest airport in the world in 1984. Some 343,818 aircraft passed through HNL. Delta Airlines, All Nippon Airways of Japan and Pacific Air Express all established operations in 1984. Duty Free Shoppers Limited agreed to sublease a portion of its operations to a bona fide minority business. This meant that the U.S. Department of Transportation/Federal Aviation Administration would release $33 million of federal airport improvement grants for Hawaii’s airports. Out of this amount, $6 million was allocated for South Ramp improvements. 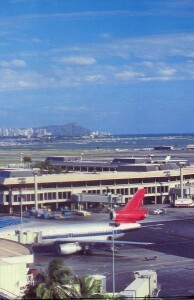 The Diamond Head Extension to the Main Terminal which began in 1982 was 70 percent completed with the end date targeted for August 1986. The 624-foot extension added 19 new check-in counters on the departure level and 10 large new baggage claim devices on the ground level. The $38 million project, when finished, will streamline passenger flow and speed up check-in and baggage claim time considerably. A first for Hawaii, the Pacific Aerospace Museum had its groundbreaking on March 4, 1985. The airport spent $120,400 to construct the museum’s exterior which is located in the Main Overseas Terminal, on the second level of the Central Concourse. The non-profit museum’s goal of raising $1.5 million will go towards developing the interiors and for displays to highlight aviation’s role in helping the Pacific Region to expand. Special programs and exhibits will also be featured. On November 16, 1984, HNL and Hickam AFB personnel responded when a United Airlines 747 jet blew two tires on the Reef Runway. Thirty-seven people were injured from the aircraft’s emergency exit chutes. In rapid succession, Pan American’s 50th anniversary on November 22, 1985 of their first flight across the Pacific was followed by the announcement of the sale of their routes west of the islands to United Airlines and then the sudden closing of all operations in Hawaii on April 26, 1986. Air Hawaii made its inaugural flight to Honolulu on November 22, 1985, and then filed for bankruptcy the following February with its last flight on February 19, 1986. After 21 years of continuous operations to all the small communities of the state, Royal Hawaiian Air Service ceased to exist on May 22, 1986. Plagued with financial problems, South Pacific Island Airways changed its schedule as they attempted to reorganize their activities. After providing late night flights between Honolulu and Kahului, Maui Airlines closed its offices on April 30, 1986. World Airways no longer appeared on the flight information screens. Among the new starters were old names to air service in Hawaii. TWA returned to the Islands on June 1, 1986. Hawaiian Air continued to expand its flights to points outside the State. Aloha began late evening B-737 QC or “quick change” jet cargo service to the Neighbor Islands. Regent Air continued to announce start of Mainland to Hawaii flights but never appeared. The constant coming and going by the air line companies was accompanied by an overall increase in passenger traffic of six percent. Updating the Master Plan for the Statewide System of Airports started in FY 86 and was completed in late 1987. This complemented the planning work underway at HNL. 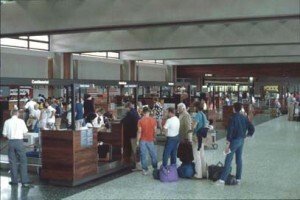 Work on the Ticket Lobby was expected to be completed in late 1986 and in mid-1987 on Lagoon Drive. Smoother traffic flows resulted with the opening of the second level bypass link between the H-1 Freeway Interchange and the Overseas Terminal Building on March 19, 1986. Apron improvements and the new Elliott Street connection to Nimitz Highway were completed as the initial steps for a new Interisland Terminal. Plans for Terminal 3 of the complex to house Hawaiian Airlines were close to completion. Studies were underway for the remaining structures which included urgently needed parking facilities in a multi-story structure. Construction was started on the addition to the International Arrivals Building to accommodate group tour arrivals. In addition visits to Washington were made to discuss the urgent need to supplement the existing staff of federal inspectors for Customs and Immigration. With the assistance of Hawaii’s Congressional delegation, authorization for additional personnel was approved. Studies were conducted to improve waiting areas in the International Arrivals Building since it was expected that federal budget limitations would not result in the larger number of inspectors needed for the program. Among the new entrants to the international airlines using this building was United Airlines which started international flights on February 11, 1986 Garuda Indonesia and Toa Domestic Airlines were expected to follow in the months ahead with All Nippon Airways changing from its charter operations to scheduled flights. With the installation of energy management, fire alarm, security and other advanced control systems, it became necessary to provide an efficient monitoring method for maintenance and management personnel. The Airport Operations and Control System provided this capability along with the Flight Information Display System (FIDS). A $4.1 million contract for a new FIDS to replace the existing, outdated equipment was proposed. 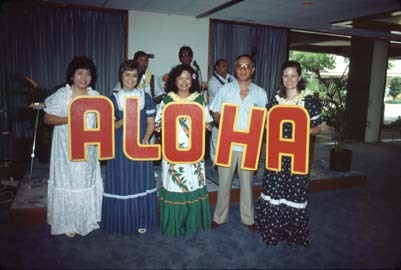 Air Hawaii made an inaugural flight to Honolulu, and then filed for bankruptcy in February 1986. Its last flight was on February 19, 1986. 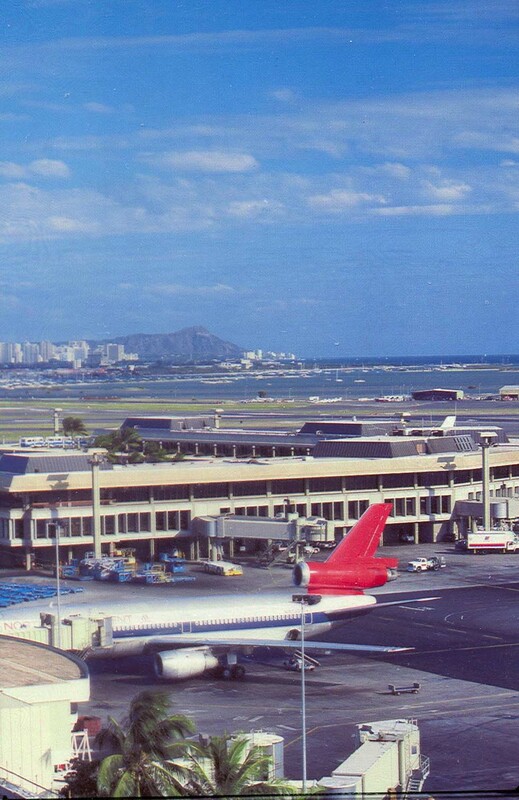 The $23.3 million Diamond Head Extension to the Main Terminal was dedicated on October 22, 1986. The Diamond Head Extension added 660,000 square feet to the existing Terminal Building. It doubled the space available for airline ticket lobbies and baggage claim areas. The basement level houses airline outbound baggage conveyors and baggage handling systems. The ground level has 10 inbound passenger baggage conveyors and claim devices, each 100-feet long and capable of handling a full 747 aircraft. The second level houses baggage check in and ticket counters, airline offices, concession spaces for flowers, newspapers, sundries, toys, jewelry, packaged foods, gifts and security checkpoints leading to the gates. 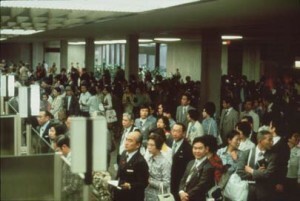 In December 1986, a new Group Tour Arrivals area was opened in the International Arrivals Building at the Ewa end of the airport. In June, a new Domestic Group Tour Arrivals area was dedicated at the Diamond Head end of the Terminal. Work was completed on the first phase of new concession facilities at the Diamond Head Extension. This was the first of several projects which resulted in upgraded concession facilities throughout the terminal area and the redistribution of concession spaces based on revised circulation patterns resulting from the opening of the Diamond Head Terminal. Construction started on the addition of a new Duty Free concession at the Ewa Pedestrian Concourse. Consultants completed design of the second phase of the new Duty Free and Restaurant facilities at the Diamond Head Terminal Extension. Design was completed on the modernization and additions to the existing Airport Baseyard, and included renovation and reconfiguration of the existing facilities and addition of support structures. Projects that will modernize the existing facilities include the renovation of the Ewa and Central Ticket Lobbies, renovation of the existing baggage claim areas, improvement to existing concession areas, renovation of the International Arrival facilities, improvements to the frontal gates, improvements to air signage and communication systems, improvements to the Administration Tower and miscellaneous terminal improvements. Designs for the Ewa and Central Ticket Lobbies have been completed and work will be started on the renovation in the early part of FY 88. The projects, which will upgrade the lobbies to the level of the new Diamond Head Extension, are expected to be completed by mid-1989. Modernization and upgrading of the International Arrivals Building have continued. Design was underway on various projects to facilitate the processing of international arrivals passengers. Construction began in March 1987 on the new Exit Plaza for the Overseas Terminal Parking Garage and rental car areas. Completion is anticipated in April 1988. Construction of the Lagoon Drive Realignment, Phase II, began in 1986 and will be completed in February 1988. The project provides a new four-lane roadway as well as 26 lease lots and 190,000 square feet of additional taxiway. Bids went out in early FY 88 on drainage improvements and a new Air Cargo Facility on the South Ramp. 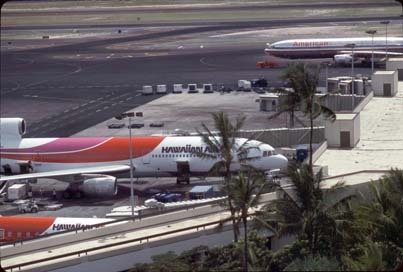 Passenger traffic at HNL during FY 87 was 19,496,069. Ground was broken on November 26, 1986 for the new Terminal No. 3 with completion expected in March 1988. The new terminal has a total area of 66,000 square feet and will provide 14 check-in counter spaces, aircraft access holdrooms, a restaurant lounge facility adjacent to the waiting lobby, operations and administrative office space for Hawaiian Airlines during construction of the new Interisland Terminal. The baggage claim area features two high-capacity belt claim devises. The terminal is designed for future modifications to a second level aircraft passenger loading operation. 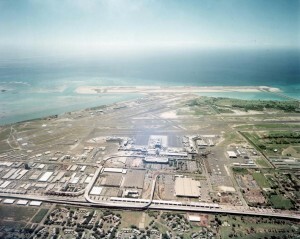 The airfield development phase for the expansion of Terminal No. 3 was partially completed in July 1986. The final increment began in March 1987. It will include the parking apron for the Terminal No. 3 as well as the postal service access road and fuel system for the aircraft parking positions. Design for the ground level roadways and parking, Phase I, was completed and prepared for advertising. Construction was expected to be completed in April 1988. This will provide groundside access to the new terminal and a new public parking facility accommodating 500 cars. 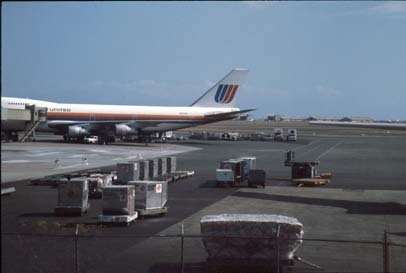 To coordinate Hawaii’s response to an increase in international travel, Governor John Waihee formed the Interdepartmental Task Force on International Aviation in November 1987. Deputy Director Jeanne Schultz headed up the Task Force. The Task Forces’ objectives were to increase the number of international visitors to Hawaii, improve the international arrival procedure at HNL and begin planning for international arrivals at Neighbor Island airports. Working with the department were the Departments of Business and Economic Development and Commerce and Consumer Affairs, the Hawaii Visitor’s Bureau, the Pacific Basin Development Council, the Federal Inspection Services, Hawaii’s Congressional delegation and industry groups. Existing Noise and Master Plans were reviewed and proposed updates included new forecasts and future improvements at the airport. Proposed changes included the revised South Ramp layout and additions to the maintenance area west of the Ewa Concourse. The Airport acquired 5.8 acres of land adjacent to HNL from the U.S. General Services Administration for the expansion of the South Ramp. On October 19, 1987, a ceremony was held to celebrate the 25th Anniversary of John Rodgers Terminal. Employees with 25 years of service at the airport were recognized during the program. Interisland Terminal No. 3 opened for service on June 2 1988, representing the first phase of the new Interisland Passenger Terminal. Built at a cost of $23.3 million, Terminal No. 3 included an innovative air conditioning system utilizing ice storage during periods of low electrical consumption with resulting low demand during peak periods. Hawaiian Airlines was temporarily housed in Terminal No. 3 to allow demolition of the old terminal building for the new structure. Terminal No. 3 will be double-decked later to enable passenger loading using loading bridges. Ten year concession contracts were awarded to five rental car operators beginning March 1, 1988. This represented an increase over the four operators previously serving the terminal. The highest bid for a duty free concession in the world was received when bids were opened on February 5, 1988 for the duty free concession at Honolulu International. For the contract period of four years and 11 months, which began July 1, 1988, Duty Free Shoppers agreed to pay more than $1.15 billion to the Airport Revenue Fund. Work was underway in FY 88 on a new computer-based airport operations and control system. Initial phases included the Flight Information Display System, fire alarm system and energy management. A security system and public information system will be added. A major upgrading of the terminal ticket lobbies, baggage claim areas and concession space was completed on the Central Concourse and contracts were awarded for the Central Lobby concession spaces. Work on the ticket lobbies and baggage claim areas were awarded in phases to allow the removal of asbestos while at the same time maintaining airline operations. When completed all lobby and concession spaces were on a par with the recently complete Diamond Head Ticket Lobby expansion. New, larger baggage claim devices will be installed to reduce congestion. Work to upgrade the administration tower was also in progress. This work will upgrade the tower’s external appearance and renovate office spaces and operational areas. Improvements continued to be made on the South Ramp to develop this area for fixed base operators, air cargo, general aviation and other aeronautical activities. Realignment of Lagoon Drive doubled the available space for the construction of hangars and cargo terminals. Passenger traffic totaled 22.3 million at Honolulu International in FY 89, a seven percent increase. A total of $41.8 million was spent upgrading airport lobbies, concessionaire shops and restroom facilities in the Main Overseas Terminal complex to give the airport a first-class look and provide airport users with pleasant and convenient areas to eat, buy gifts or just relax while waiting for planes. While designs on the multi-level Interisland Terminal Complex, new International Terminal Building and South Ramp expansion project were in progress, the airport initiated the renovation of many of the existing airport facilities to accommodate travelers during the interim design and construction phases. Renovations to the Aloha Airlines gate areas and expansion of its passenger waiting areas were undertaken to accommodate travelers until the new Interisland Terminal is completed. In preparation for the next phase of the new Interisland Terminal Complex, construction of a temporary steel up-ramp to the Main Terminal began in May 1989. Waiting room and restroom facilities of the existing International Arrivals Building were expanded to accommodate more foreign arrival passengers and the air conditioning system was also improved to provide a more comfortable atmosphere for passengers. In response to the long lines in U.S. Immigration and Naturalization Service and U.S. Customs, the airport hired additional Visitor Information Program specialists and International Arrival Passenger Coordinators to expedite the processing of foreign arrival passengers. Improvements to develop the South Ramp for fixed base operators, air cargo, general aviation and other aeronautical activities, continued. United Parcel Service began operating at the South Ramp after contractors finished grading and paving the area. Sewer, water, electric and telephone utilities were also installed. In May 1989, the Reef Runway was chosen as one of several emergency landing sites for the National Aeronautical and Space Administration’s space shuttle and the Corps of Engineers began installation of navigational and landing aids. Efforts to improve airport security were initiated through installation of an operation control system and a new computerized security access system. New public address and potable water systems were also installed, along with new flight information displays. Noise Exposure Maps, describing levels of disturbance by aircraft on areas adjacent to the airport were completed. Noise Compatibility Program studies continued. To keep an open line with the public, a 24-hour toll-free telephone line was installed to respond to public complaints relating to aircraft noise. Efforts to update the Statewide Airport System Plan which forecasts movements of passengers and cargo by air into and though the state continued. During the process of developing and detailing these studies, several public information meetings and public hearings were held to discuss findings and alternative methods to reduce noise conflicts. 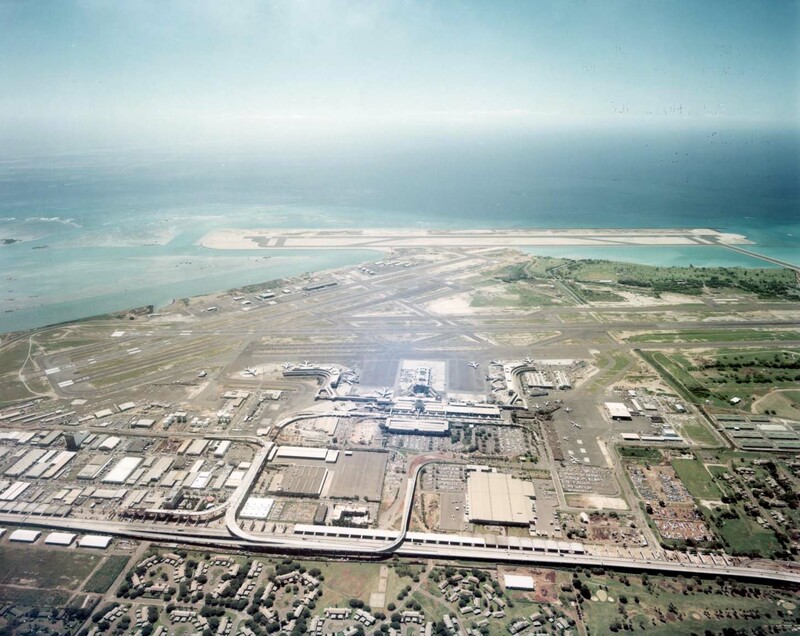 The Honolulu International Airport Master Plan was completed in 1988. 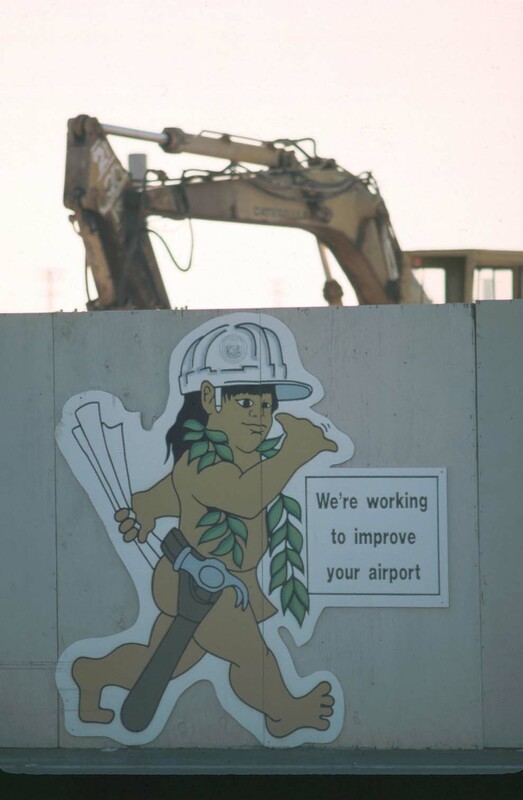 To help both tourists and residents find their way through construction detours and airport improvements, the airport launched its innovative Menehune Program on November 16, 1988. Through construction updates, directional signage and helpful airport employees, the Menehune Program helped to ease the construction burden on passengers and aided all airport users. When all renovations and improvements are finished, Hawaii will have a first-class airport for both residents and visitors. With the help of airport Menehunes who exhibit the spirit of Aloha, construction will be completed quickly and efficiently. 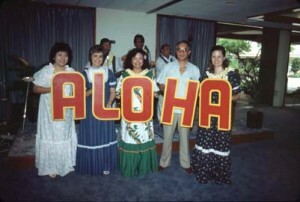 In an effort to create an extra special aloha welcome for visitors, Aloha Friday was initiated on March 31, 1989. Each Friday, hula dancers and musicians played Hawaiian favorites for arriving passengers at the various gates and at Immigration. On May 17, 1989, there was an inaugural flight to HNL from Manchester, England. Japan Air System’s Inaugural flight to HNL was held on June 16, 1989. Passenger traffic at Honolulu International totaled 23 million in 1988, a 3.2 percent increase over the previous fiscal year. America West inaugurated service to Honolulu on November 16, 1989. Improvements to the Ewa Ticket Lobby in the Overseas Terminal were completed. The asbestos ceiling was removed and a new drop ceiling was added, including modern lighting, public address, fire alarm and access control systems. Work progressed on construction of the new Interisland Terminal Complex, the design of the International Terminal Building, automated people mover system, and the development of the South Ramp. On November 22, 1989, a groundbreaking ceremony for the new Interisland Terminal Complex was held. The multi-story terminal will have baggage claim and ground transportation facilities on the ground level, and airline ticket lobbies and gates on the second level similar to the Overseas Terminal. The new people mover will be on the third level. Four floors of parking for 2,000 cars will top off the new Interisland facility. At the site of the new Interisland Terminal Complex, construction was completed on a temporary ramp leading from the ground level, up to the departure level of the Overseas Terminal. The old ramp was demolished to make way for the construction of new roadways leading to the new Interisland Terminal Complex. Foundation and utility work for the Interisland Terminal’s Central Building was underway and should be completed in October 1990. Work on the Central Building itself was expected to begin the following month and be completed in August 1992. Interim modifications were made to the Aloha Airlines area which created new holdrooms, gates, an outdoor restaurant and a VIP lounge area to better accommodate travelers during construction of the new Interisland Terminal. Work started on a new aircraft parking apron which was being added in front of the Hawaiian Airlines terminal. Site preparations were completed for a new Interisland Cargo Facility. The project included the construction of access roads, underground utilities and water lines for the future facility. While design work continued on the new Interisland Terminal Building, work proceeded on interim improvements to better accommodate passengers in the present International Arrivals Building. For more information about the history of Honolulu International Airport, click on one of the decades below.